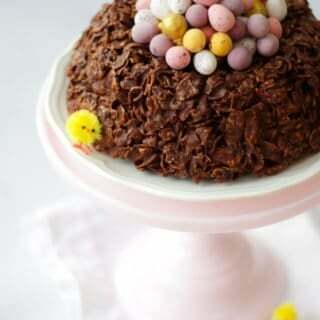 This easy GIANT Easter Nest Cornflake Cake Recipe is so much fun to make. Simple and really tasty, a fab no bake Easter make full of candy treats. It uses just 5 store cupboard ingredients - butter, chocolate, golden syrup and cornflakes.. Topped with Mini Eggs of course! Gently melt the chocolate, syrup and butter. Ideally in a bowl over a simmering pan of water. Stir until smooth and remove from the heat. Stir in the cornflakes and mix until totally coated and no bare cornflakes remain. Press into the bundt tin and chill in the fridge until set, about 2 hours. Remove from the fridge, flip out of the tin and pour your chocolate eggs into the centre. Serve immediately.